I borrowed a really small car last week. 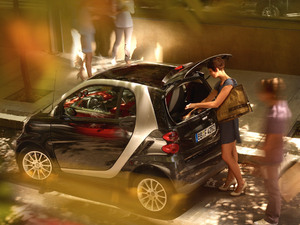 It was the smart fortwo cabrio diesel, officially called the smart cdi. It was an eye opener for a couple of reasons. First because it was running on a mix of ordinary diesel and jatropha, a biofuel made from a spiky bush originally used for keeping cattle out of croplands (no gobbling up vital food reserves with this fuel). Second, because of the completely unexpected response from other drivers - but I will come to that later. The jatropha mix seemed very effective. It allows the car, albeit small, to be one of the most planet-friendly transport devices around. It manages to sip a piffling 3.3litres every 100km using straight diesel; admitted the jatropha mix doesn't seem to give quite such good consumption, but the plus is it only puts out some 90g/km of CO2, claimed as less than the hybrid electric Toyota Prius. And as the jatropha is a plant, it soaks up CO2 as it grows. Can't ask for more than that, can you? Because it is a diesel, it still manages to produce reasonable low down go away from the lights from the 799cc three cylinder diesel. Admitted it feels a bit lumpy when the engine isn't revving hard - maximum torque is at a mere 2,300rpm. And the automatic/clutchless manual 5-speed gearbox isn't the slickest changer on the block, but hey, its absolutely fantastic around town. It's highly manoeuvrable, comfortable and well fitted out inside. It can park almost anywhere, you can roll the top back to hear the sound of birds in the trees, and with a 130kph top speed is more than quick enough for city use. You can even get a couple of fish tanks in the small-but-tall boot space behind the seats (we tried); weekly shopping would be easy-peasy. So as a small footprint, eco friendly, practical town vehicle it is as good as they come. The downside is you have to put up with what appears to be an almostly universally imbecilic response from other road users - in Singapore, at any rate. I ride a motorbike so I am used to being cut up on the road by drivers that don't see me. But it was far worse in the smart jatropha. Almost without exception, other drivers would treat it as though it was just a nuisance on the road, and simply cut in front - whether moving or stationary. This applied especially to drivers of 'luxury' cars who presumably assumed their excessive gas-guzzling capability gave them the right to behave like total klutzes and queue-bargers. Even more disappointingly, the appearance of the car drew many more condescending laughs, hoots and rude gestures than admiring glances for its agility and road-sharing ability. Sure, it doesn't look like a Rolls Royce, but small phones and MP3 players don't get that response. So the experience of the smart was definitely mixed. As a sensible, socially-responsible mode of city transport it has few equals. It's a great little car. As a city-friendly design solution it is recognised by being able to avoid congestion charges in some European cities, and to offer much more parking capability (Berlin allows two per standard space). It has clever safety protection features such as an exterior bracing with tridion cell reinforced by high strength steel sheets (like a hard nut cover with soft interior), raised seats within a sandwich styled body that's away from direct harm of side collision and wheels that absorb shock. But until other road users grow up and see the value of its frugality, eco-friendliness and agility, driving it is not going to be a pleasure, in Singapore at any rate.